What Has Happened to the Innocence of My Childhood Halloweens? Am I the only one who’s noticed what has sort of insidiously happened to the otherwise happy holiday of Halloween? It’s been KIDNAPPED! I ‘m talking about a fun-filled and fantastical day that’s turned grim, gruesome and ghastly. 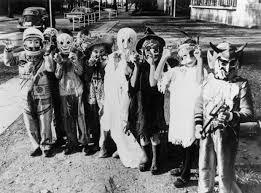 Halloween has always been a bit frightening, as imaginations and pretend are given free rein. Kids and even adults, for a day, get dressed as anyone they choose and for the most part, are playfully anonymous in the process. It’s supposed to be childhood at its fanciful best. But c’mon, look around at what it’s BECOME. Sort of like Larry Talbot in the vintage “The Wolfman “ movie, it’s CHANGED! I guess what I’m asking is sort of akin to the rhetorical question – Are certain things, say for instance movies, a REFLECTION of the culture or do THEY change IT? It’s a question worth pondering. And certainly where it influences our children, it should be worth consideration. Enter Halloween. But, with Halloween, need it be so GRAPHICALLY displayed on a holiday that used to be filled with puckishly dressed clowns, hobos, princesses, firemen, ghosts, witches, pumpkins and the like. These characters seem to have been co-opted by a bunch of ghoulish goblins of unbelievably frightful and bloody imaginings. Can we insulate our children from the reality of an increasingly violent world these characters reflect? I am not that naïve. But can we let them be kids for one night without the intrusiveness of gore and guts? My suggestions for Halloween themed books have their share of the frightening and some darker imaginings. But I think kids can happily enjoy some of these vintage retellings and new fearsome tales with a happy heart. Still, I love the question on most children’s lip’s during the month of October – “What are you gonna BE for Halloween?” Something funny, fearsome or fantastic would be my guess. So Happy Halloween! Let the enjoyment of the sounds of cauldrons bubbling and witches cackling fill the air as you cuddle with a child and one of these Halloween books. Boo!